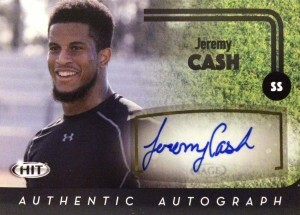 Jeremy Cash is a force to be reckoned with while in the box. The strong safety is a physical presence evidenced by him recording 326 tackles and 7 forced fumbles over 3 years for the Duke Blue Devils. 10 years ago, there’d be a lot more buzz on Cash, but as the game has evolutionized to more of a passing game, there’s been less and less room on a roster for a straight line in the box safety. While his pass coverage may be considered suspect by scouts, there’s no question that he’s an elite enforcer that some team will pony up for. Drawing comparisons to TJ Ward, Cash somehow slipped completely off the draft boards; However, Jeremy paid no mind, as a bidding war ensued for his services. Apparently upwards of 20 teams had him targeted as a priority free agent. He’d later sign with the Carolina Panthers as Jeremy received one of the most lucrative signing bonuses among the free agent class. The Panthers plan to utilize him at linebacker.